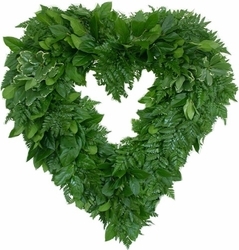 Home > Wreaths > Leather Leaf Deluxe 24"
Beautiful heart-shaped wreath made from fresh Leather Leaf, Salal, and Variegated Pittosporum foliage. This is a perfect decoration for any wedding or just simply to show your partner your love on Valentine's Day! Our wreaths are made fresh, by hand! This item will keep its' fresh look for approximately 1-2 weeks.